Emily Belden, BA’08, has been writing creatively since a very young age. Letters to Santa Claus, the Tooth Fairy and even her parents were a creative outlet for her. That eventually led her to choose journalism as her major with a focus on advertising at Creighton University. Belden recently visited her alma mater as a keynote speaker for the Heider College of Business Creighton Business Symposium on Nov. 2 on the topic of risk-taking. 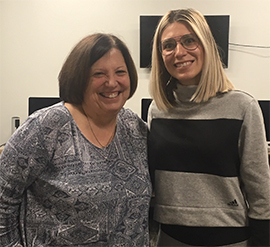 Prior to that speaking engagement, she visited the Department of Journalism, Media and Computing (JMC) and spoke with a small group of students and department chair Carol Zuegner, PhD, in an informal gathering. The Chicago suburb native shared with the group about her career path, the process of book writing and how she achieved a two-book publishing deal with the world’s largest publisher, HarperCollins. Belden stayed in Omaha after graduating from Creighton and worked as a freelance copywriter at several ad agencies, including Ervin & Smith, Sleight Advertising, Anderson Partners and others. After a few years, she moved back to Chicago, worked in hotels as an advertising copywriter, and ultimately wrote a memoir about dating in Chicago, Eightysixed: A Memoir About Unforgettable Men, Mistakes, and Meals. After Belden reached out to a journalist at lifestyle publication Michigan Avenue Magazine, they wrote a spread on her memoir. Following reflection on a real-life failed relationship, Belden began writing what would become Hot Mess, her debut novel published by HarperCollins/Harlequin. She wrote the book in just three months, and through connections she had made in her career, found an agent and signed a two-book deal. Hot Mess was released in March 2018, and in 2019, her sophomore novel, Husband Material, will be released. More information about both books can be found at emilybelden.com. Speaking to the group of JMC students, Belden discussed the differences between writing the first novel on her own schedule and writing the second novel within the deadlines from the publisher. “It was more stressful to write under contract with tighter deadlines and editing,” she admitted. However, she said she is grateful for the opportunity provided to her. While still pushing sales for Hot Mess, Belden was writing and editing Husband Material. The idea for the first novel came to her based on her own past experiences. “The idea for the second novel,” she said, “was agreed upon with my agent.” Belden conducted focus groups with women who are widows to gain some insight on the topic, and then created an outline and a storyboard for the entire novel. A third novel is in the works and Belden has met with a studio in Los Angeles about making a TV series based on Hot Mess and a podcast adaptation of her memoir. She would love to work in TV and other mediums. As she concluded her visit with the JMC students, Belden told them to use what they have learned at Creighton in their future careers. She said she used her understanding of media relations to aide in her success – the tenacity of a news reporter has been what she has taken into this whole process.